WASHINGTON — In some of the most conciliatory remarks to North Korea made by the Trump administration, Secretary of State Rex W. Tillerson complimented the government in Pyongyang for going more than two weeks without shooting any missiles or blowing up any nuclear bombs. “I’m pleased to see that the regime in Pyongyang has certainly demonstrated some level of restraint,” Mr. Tillerson said, suggesting that the brief pause in testing may be enough to meet the administration’s preconditions for talks. That was the carrot. As for the stick, the Trump administration announced new sanctions against China and Russia on Tuesday as part of its campaign to pressure North Korea to stop its development of nuclear weapons and missiles. The two moves are part of the Trump administration’s dual-track strategy for taming the nuclear threat from North Korea — ratcheting up economic pressure on the government through sanctions while simultaneously offering a diplomatic pathway to peace. Then, a little more than two weeks ago, the United Nations Security Council passed its toughest sanctions yet against North Korea. And the next day, Mr. Tillerson met with his counterparts in South Korea and China in an effort to increase pressure on Pyongyang. The United Nations sanctions were already starting to have an impact curtailing trade in China and infuriating Chinese seafood importers, who had to return goods to North Korea. Mr. Tillerson’s remarks Tuesday were particularly noteworthy because they were made in a news conference that was otherwise devoted to discussing the Trump administration’s new approach to the war in Afghanistan. There is fierce debate in the administration over what course to take with North Korea — and whether a combination of diplomatic outreach and military threats would change North Korea’s current direction. Tension between the United States and North Korea has escalated over North Korea’s recent missile tests. Most intelligence assessments have concluded that the North has no incentive to begin negotiations until it demonstrates, even more conclusively than it has in recent weeks, that its nuclear weapon could reach the United States mainland. But Mr. Tillerson’s diplomatic outreach has been repeatedly undercut by President Trump’s bellicose rhetoric, including a threat to unleash “fire and fury” against North Korea if it endangered the United States. The new sanctions issued by the Treasury Department affect six individuals and 10 organizations with financial ties to Pyongyang’s weapons program. They represent a gradual increase in pressure on China, which has long frustrated the United States for economically supporting the regime in Pyongyang. Some 90 percent of North Korea’s trade is with China. “It is unacceptable for individuals and companies in China, Russia and elsewhere to enable North Korea to generate income used to develop weapons of mass destruction and destabilize the region,” Steven Mnuchin, the Treasury secretary, said in a statement on Tuesday. In June, the Trump administration imposed sanctions on a Chinese bank, a Chinese company and two Chinese citizens to crack down on the financing of North Korea’s weapons program, the first set of secondary sanctions against North Korea that directly targeted Chinese intermediaries. “I think it’s a significant action by the Trump administration,” Anthony Ruggiero, a senior fellow with the Foundation for Defense of Democracies, a nonprofit group in Washington, said of the new round of sanctions. Tuesday’s actions appeared to be part of a larger campaign to pressure individuals, businesses and countries with financial ties to North Korea, said Mr. Ruggiero, a former official in the Office of Terrorist Financing and Financial Crimes at the Treasury. “It looks like the beginnings of a broad pressure campaign,” Mr. Ruggiero said. Among the Chinese companies sanctioned on Tuesday is Mingzheng International Trading Limited, considered by the Treasury Department to be a “front company” for North Korea’s state-run Foreign Trade Bank, which has been subject to American sanctions since 2013. In June, United States prosecutors accused Mingzheng of laundering money for North Korea and announced that the Justice Department would seek $1.9 million in civil penalties. The new United States sanctions address how other nations tolerate North Korea’s behavior, particularly China, said Elizabeth Rosenberg, a senior fellow at the Center for a New American Security in Washington. INU – While the regime in Tehran tried to divide the Arab world, the Iran lobby sought to shift blame, no matter what U.S. administration was in office or which political party controlled Congress. Whether the transgression was its human rights violations, wars in neighboring countries, or the arrest of dual-national Iranians, U.S. policy was blamed. The opium trade was attributed to Afghanistan. U.S. sanctions were blamed for the miserable economic conditions. Recently, an editorial by Reza Marashi of the NIAC appeared in Haaretz, which warned the U.S. from using the North Korean threat as a tie-in to Iran. “First, conflating Pyongyang and Tehran is troublesome for an obvious reason: One has the bomb, and the other does not,” wrote Marashi. President Hassan Rouhani told Iranian lawmakers this week that Iran could walk away from the nuclear deal and restart its nuclear program in a “matter of hours” and bring a weapon to fruition in short order, although, according to the Iran lobby, the gap between North Korea’s and Iran’s nuclear capabilities was supposedly to be years apart. Marashi claims that American policies in confronting other regimes with nuclear ambitions, such as Libya and Iraq, have motivated the Iranian regime to work harder to build their nuclear program. The “state-of-the-art monitoring” Marashi cites is not actually meaningful monitoring. The nuclear deal’s agreement prohibits international inspectors from accessing many of Iran’s military bases and allows collection of soil samples only after extensive scrubbing and removal of topsoil, which is then handed over to inspectors by Iranians. Still, most importantly, the connection between Iran and North Korea is the missiles. North Korea escalated Iran’s ballistic missile program by licensing its technology and providing upgrades, improvements and technical advice. North Korea now has powerful missiles that are capable of reaching the U.S. mainland. Iran and North Korean exchange technical data, and news reports of the potential for Iranian scientists working in North Korea to learn its manufacturing processes for building nuclear warheads for its missiles are increasing. North Korea’s leader received a report from his army on plans to fire missiles towards Guam and said he will watch the actions of the US before making a decision to fire, North Korea’s official news agency said on Tuesday. Kim Jong-un ordered the army to be ready to launch should he make the decision for military action. North Korea said last week it was finalising plans to launch four missiles into the waters near the US Pacific territory of Guam, and its army would report the attack plan to Kim and wait for his order. Kim, who inspected the command of North Korea’s army on Monday, examined the plan for a long time and discussed it with army officers, the official KCNA agency said. “He said that if the Yankees persist in their extremely dangerous reckless actions on the Korean Peninsula and in its vicinity, testing the self-restraint of the DPRK, the latter will make an important decision as it already declared,” it said. The DPRK stands for North Korea’s official name, the Democratic People’s Republic of Korea. North Korea’s threat to attack near Guam prompted a surge in tensions in the region last week, with US President Donald Trump warning he would unleash “fire and fury” on North Korea if it did so. Kim said the US should make the right choice “in order to defuse the tensions and prevent the dangerous military conflict on the Korean Peninsula”. The visit to the Korean People’s Army Strategic Force marks Kim’s first public appearance in about two weeks. Trump spoke to Shinzo Abe, Japan’s prime minister, late on Monday to discuss North Korea. “President Trump reaffirmed that the United States stands ready to defend and respond to any threat or actions taken by North Korea against the United States or its allies, South Korea and Japan,” a White House statement said early Tuesday. South Korean President Moon Jae-in said on Tuesday there would be no military action without Seoul’s consent and his government would prevent war by all means. “Military action on the Korean Peninsula can only be decided by South Korea and no one else can decide to take military action without the consent of South Korea,” Moon said in a speech to commemorate the anniversary of the nation’s liberation from Japanese military rule in 1945. “The government, putting everything on the line, will block war by all means,” Moon said. North Korea is angry about new UN sanctions over its expanding nuclear weapons and missile programme and annual military drills between the US and South Korea beginning later this month that North Korea condemns as invasion rehearsals. A Guam official said he was “ecstatic” as North Korea appeared to back away from its threat. “There doesn’t appear to be any indication, based on what we’re hearing, that there will be any missiles attacking in the near future or in the distant future,” Lieutenant-Governor Ray Tonorio said. Jim Mattis, US defence secretary, warned on Monday the US military would be prepared to intercept a missile fired by North Korea if it was headed to Guam. Mattis said that the US military would know the trajectory of a missile fired by North Korea within moments and would “take it out” if it looked like it would hit the US Pacific territory. “The bottom line is, we will defend the country from an attack. For us that is war,” Mattis said. Richard Broinowski, former Australian ambassador to Seoul, told Al Jazeera from Sydney on Tuesday that there was no real threat of war. He also said that the solution was direct talks without conditions between the US and North Korea. “It’s been tried before and it needs to be tried again,” said Broinowski. Pay no attention to that mullah behind the curtain, the North Korean regime implicitly orders the world as they keep ramping up missile tests, increasing the volume of bellicose rhetoric and crafting their four-missile plan for attacking Guam. Sure, Iran and North Korea — along with another of their toxic allies, Russia — were partners as targets of the nearly unanimous sanctions that recently sailed through Congress. But they’re partners in so many ways — other than both holding U.S. hostages — from the weapons trade to circumvention of sanctions that every action coming out of Pyongyang needs to be weighed in broader context of the Iran relationship, and even as a test run of Iran’s ultimate ambitions for its own weapons capability.Iran is almost living vicariously through North Korea’s horn-locking with the Trump administration, engaging in weapons-grade trolling with state media loving the story and underscoring that Pyongyang is simply moving to protect the DPRK from unbridled U.S. aggression — the same convenient argument that Tehran makes to justify its own provocative actions.And there are early indications that Iran plans to act like Kim Jong Un’s war room — in the campaign sense, at a minimum — during Pyongyang’s testing of UN and Washington fortitude. A day before Kim’s Guam threat, the semi-official Fars News Agency ran a retrospective on Hiroshima and Nagasaki in which they defended most nuclear countries including North Korea: “So much is said every day about nuclear weapons and threats from nuclear-armed states, but that one historic fact remains among all the blather,” went the piece. “For all the talk, only America has dropped the bomb.” Iran is paying close attention to the untested dynamics of a new world order in which the Patton-admiring President of the United States vacillates in a love-disappointment relationship with China, has nary a bad word to say about the Kremlin, comes to loggerheads with NATO allies and may or may not call quits on the Iran nuclear deal. While North Korea tests the system by wagging its rogue nuclear power, Iran wants to know how the globe reacts. And this observation isn’t happening in a vacuum, as Iran, North Korea and the rest of their friends take notes on how their axis can hoodwink our allies. Because theirs is a long-term relationship, they also have the motivation to move closer to each other in not only fighting the Great Satan but in worrisome financial and military bonds. On Aug. 3, the No. 2-ranking official in North Korea, president of the Supreme People’s Assembly Kim Yong Nam, arrived in Tehran for a 10-day visit, longer than many honeymoons and suspected to be chock-full of meetings on how the two can widen cooperation in a range of fields and battle sanctions hand-in-hand. They’ve already had a share-and-share-alike relationship when it comes to missile technology, with Iran’s Shahab-3 intermediate-range ballistic missile capable of striking Israel almost mirroring the North Korean No Dong 1 — and Pyongyang, in the line of nefarious hand-me-downs, likely borrowed their engine technology from Russia. Iran was an investor in the No Dong before it even went to the testing ground. This long-running “you do the research, we provide the cash” marriage is basically tailored for a post-P5+1 deal world: Iran rakes in the dough from lifted sanctions, continues their ballistic missile program that wasn’t included in the deal, and has extra cash from above board or under the table to send North Korea’s way for continued nuclear development and testing that will be shared with Tehran in the end. To avert a potentially devastating conflict, the State Department is dangling the offer of conditional talks with North Korea. And Iran would be an invisible yet powerfully influential presence in the negotiating room. Pompeo praised the efforts of U.S. Ambassador to the United Nations Nikki Haley and Secretary of State Rex Tillerson in getting China and Russia to join in a unanimous U.N. vote recently to impose tougher sanctions on North Korea, amid the country’s pursuit of a nuclear weapon. Trump last week said North Korea would be met with “fire and fury” if leader Kim Jung Un followed through on a threat to execute a missile strike on nearby Guam, a U.S. territory with an American military base. Pompeo said Sunday, “The president made clear to the North Korea regime how America will respond if certain actions are taken. The director also dismissed talk from those in previous administrations who suggested the Trump White House was surprised by a news report that North Korea now has a miniaturized nuclear warhead that can be put on an intercontinental ballistic missile that could hit the U.S.
“It doesn’t surprise me that those who came before us were surprised; they did nothing,” Pompeo said. U.S. intelligence analysts say North Korea has developed a warhead that fits on its ballistic missiles, including an intercontinental ballistic missile capable of reaching U.S. territory, according to The Washington Post. While the latest report assumes significance in the current climate of heightened tensions between the U.S. and North Korea, it represents only more certainty over previous assessments. Four years ago, for example, the DIA said it believed with “moderate confidence” that North Korea had mastered nuclear warhead technology. Since North Korea has conducted multiple tests of both nuclear weapons and ballistic missiles, the basic components for a nuclear-tipped ICBM were already known to exist. As NPR’s Geoff Brumfiel reports on All Things Considered, the technology hurdle for Pyongyang is to produce a relatively small, lightweight weapon that North Korean missiles are capable of getting to a target. To build a nuclear weapon, Brumfiel says, you start with a lot of conventional explosives that trigger the nuclear chain reaction. That is apparently what North Korean scientists and engineers have managed to accomplish. And Pyongyang has made no secret of its apparent accomplishments. In 2016, Kim Jong Un was photographed next to what is believed to have been a model for a small nuclear device, nicknamed the “disco ball,” by Western observers. However, Brumfiel says the best pieces of evidence are the nuclear tests themselves. “They’ve done five nuclear tests now. Other countries have been able to miniaturize in fewer tests, so it seems reasonable to assume that they’ve been able to miniaturize by this point,” he says. Iran’s President Hassan Rouhani meets with North Korea’s ceremonial head of state, Kim Yong Nam in 2013. 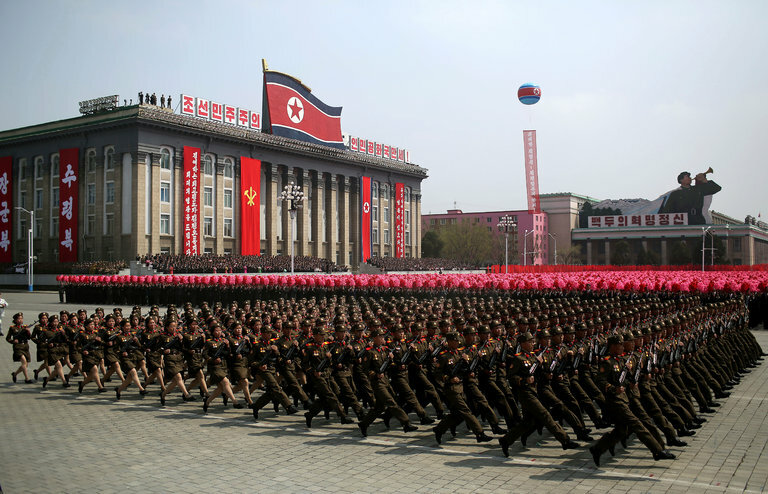 Amid new international sanctions, North Korea’s “No. 2” official embarked on a 10-day visit to Iran, a move that could result in the two sides expanding their ties. Iran’s official IRNA news agency reported Kim Yong Nam, chairman of the Supreme Assembly of North Korea, arrived Thursday for the weekend inauguration ceremony for Iranian President Hassan Rouhani. But given the head of North Korea’s parliament is expected to stay for 10 days in Iran, the trip is being seen as a front for other purposes, including expanding military cooperation. At the same time, Pyongyang is looking for ways to counter sanctions and to boost the hard currency for the dynastic regime led by Kim Jong Un. “There could be very problematic cooperation going on because of the past history and because it makes strategic sense, especially for Iran now,” said Emily Landau, a senior research fellow at the Israeli-based Institute for National Security Studies and head of the Arms Control and Regional Security Program. INSS is an independent think tank affiliated with Tel Aviv University. Kim Yong Nam’s visit coincided with a move by the United Nations Security Council to slap sanctions that bar exports of North Korean coal, lead, iron ore and seafood. The new restrictions could slash the hermit regime’s roughly $3 billion annual export revenue by one third. The U.S.-sponsored resolution, which passed unanimously, followed the North’s second intercontinental ballistic missile launch last month. It also curbs the number of North Korean laborers working abroad and clamps down on new economic joint ventures with Pyongyang. The new sanctions have been proposed for some time by Washington, and pressure was applied on China, North Korea’s longtime ally and its largest trading partner, to go ahead with them. Once the U.S. obtained Beijing’s approval on the new resolution, it began negotiating with other nations part of the 15-member U.N. Security Council. In comments after his swearing-in ceremony Saturday, Iran’s Rouhani said, “The sanctions policy in today’s world is a failed and fruitless policy,” according to a report from Iran’s semi-official Fars news agency. Meanwhile, the man whom Iran described as the North’s “No. 2” is believed to be traveling with a delegation of other officials from Pyongyang, including economic and military officials. “Both the North Koreans and Iranians feel a serious threat from the United States and the West and sort of see each other as very different countries but facing a somewhat similar situation,” said Matthew Bunn, a nuclear proliferation expert and professor of practice at Harvard University’s John F. Kennedy School of Government. After the second ICBM test last month, defense experts said it appeared North Korea’s long-range ballistic missile had the range to reach half, if not most, of the continental United States. Iran could have an ICBM capability similar to North Korea within a few years, as just last week it successfully launched a satellite-carrying rocket that some see as a precursor to long-range ballistic missile weapon capability. For example, Tehran’s Shahab-3 ballistic missile, capable of reaching Saudi Arabia from Iranian land, is based on technology from North Korea’s Nodong-1 rockets. Iran’s Ghadir small submarine, which in May conducted a cruise-missile test, is a vessel remarkably similar to those used by Pyongyang. There’s still a bit of a mystery on the nuclear side, but some former CIA analysts have previously said Iranian scientists have attended nuclear tests in North Korea. There have been recent reports North Korea may be preparing for its sixth nuclear test, and it’s not out of the realm of possibilities that new international sanctions could provoke Pyongyang to go ahead with the test as a form of protest. Tehran’s hands are tied due to the international nuclear agreement, although there’s a possibility it could quietly be teaming up with North Korea on nuclear research and doing it from the Korean Peninsula. “The fact they are cooperating so closely on the missile realm is cause to believe that there could be even more cooperation going on even directly in the nuclear realm,” said Landau, the Israeli-based national security expert. Bunn, however, isn’t so sure there’s currently any collaboration on the nuclear side between the two regimes but said “there’s a real danger potential” of it happening. – Reuters contributed to this reporting. Most analysis of North Korean missiles comes from images released from Pyongyang, and they could be purposefully deceptive. The real ICBM program may be a hidden silo-based missile, which would be much more dangerous. Kiessling, who works at the Office of the Secretary of Defense, gave Business Insider his personal views on North Korea, which do not represent the Pentagon’s official stance. Through a painstaking analysis of imagery and launch statistics from North Korea’s missile program, Kiessling has concluded that the road-mobile, truck-based missiles they show off can’t actually work as planned, and may instead be purposeful distractions from a more capable missile project. “The US and the Soviets tried very hard and never managed to reach a level of miniaturization and ruggedness that would support a road-mobile ICBM,” said Kiessling, referring to the minaturization of nuclear warheads needed to fit them onto missiles. ICBMs that use liquid fuel, as North Korea’s do, are “very likely to crumple or damage the tankage” while being carted around on a bumpy truck. “While it may not be impossible, it’s bloody difficult and extremely dangerous,” to put a liquid-fueled ICBM on a truck, according to Kiessling. But there’s no evidence of North Korea building a silo for missile launches, and Kiessling said that could be due to a massive deception campaign that may have fooled some of the world’s top missile experts. This analysis matches the comments of Mike Elleman, a senior fellow for missile defense at the International Institute for Strategic Studies, who told Business Insider he saw the Hwasong-14 as an “interim capability” that North Korea was using to demonstrate an ICBM as quickly as possible. Elleman believes that North Korea well develop a “heavier ICBM” that “may not be mobile,” but can threaten the entire continental US and carry a heavier payload, including decoys and other penetration aides. But other prominent analysts disagree with Kiessling’s model, saying he incorrectly judged the size of the Hwasong-14. To that, Kiessling says that North Korean imagery, which has all been purposefully released by a regime known to traffic in propaganda, is geared towards deception. “One of the hardest problems imaginable is to find something you’re not looking for,” said Kiessling, of a possible missile silo in North Korea. A silo would also prove an inviting target for any US strikes on North Korea, as the target can’t hide once its found. 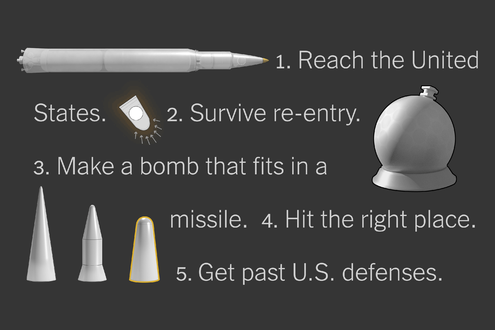 If the US were to find out that North Korea hadn’t succeeded in miniaturizing its warheads enough to fit on its mobile missiles, a smaller-scale strike against fixed targets may seem like an attractive, doable option.